Louis Van Gaal led Manchester United to its first FA Cup win in 12 years, the first Cup for captain and club legend Wayne Rooney. It announced to the rest of the world the rise of young stars like Anthony Martial and Marcus Rashford and marked the first hardware that Man Utd have won since 2013. Saturday was a good day for van Gaal. On Sunday he was fired. Sir Alex Ferguson is arguably the greatest manager in the history of soccer and his name is deeply embedded in the brand of Manchester United. His name adorns a stand at Old Trafford and his statue looks out from the stadium. It isn’t just his effigy that looms over the team, but his legacy as well. Ferguson won 13 league titles, five FA Cups, two Champions league titles, and a plethora of other honors during his 26 year reign. He guided the team to 20 consecutive seasons of top-3 finishes and through him, Manchester United’s success seemed inevitable. His retirement was well plotted out by the club and lovingly documented by the press. But the inevitability of Manchester United fractured within a year of his leaving. 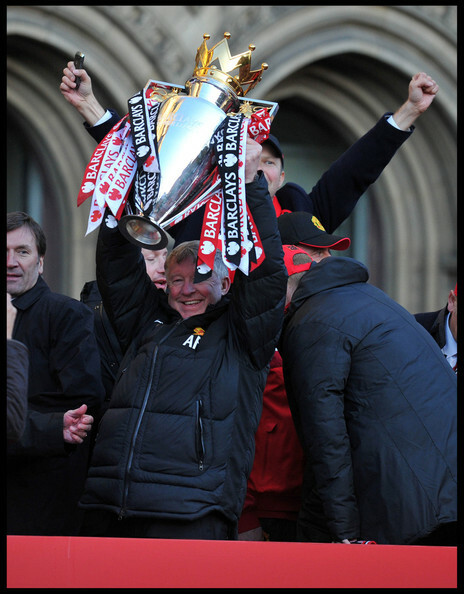 Former United Manager Sir Alex Ferguson after winning United’s last Premier League title in ’13. When van Gaal came to Manchester he was hailed as a savior, newly arrived from a successful Dutch world cup campaign to right the wrongs of David Moyes. Moyes had suffered a tumultuous ten month reign that ended in unspectacular failure as Manchester United missed the Champions League for the first time in nearly 20 years. The perennial champions had fallen and the roots of more structural problems were clearly visible. Fan issues with club ownership had drawn down to a simmer in during Ferguson’s twilight years, but the clubs fall down the league table had brought them right back to a boil. The Glazer family, which owns the largest stake in Manchester United and the Tampa Bay Buccaneers through family owned companies, was viewed as villains and their appointed executive at the club, Bob Woodward, was deemed incompetent by the fans. Moyes had repeatedly said he was not given the room to succeed at Manchester United, blaming the FA, the team’s schedule, players, and the organization for his failure. This flies in the face of the fact that he was the hand-picked successor of Sir Alex Ferguson, the greatest man in club history. But it does set up a pattern of managers finding the manager’s chair a bit warm at Old Trafford. After the failure of Moyes, United needed a turn around. Whether the team expected a return to championship form, just two seasons old, is unknowable, but in his first season van Gaal was able to stabilize the club, but a return to glory would need more time. The club had brought in Argentinian star Angel Di Maria who floundered under the new manager and was ultimately sold to Paris Saint-Germain at a loss of over 15 million pounds. Already the drumbeat was starting, that maybe van Gaal wasn’t the Ferguson successor that had been hoped for. 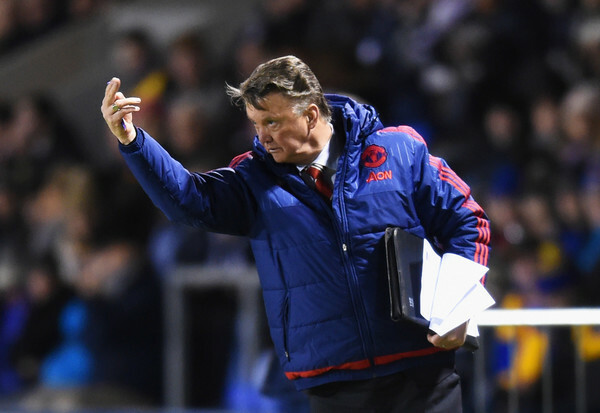 For his part, van Gaal preached that the turn-around was a three year job. 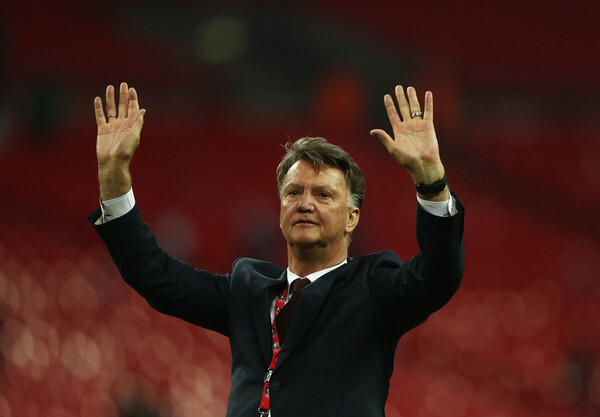 By the start of his second season as manager van Gaal was officially on the hot seat. New additions had been brought in for the team to succeed, like Anthony Martial who was purchased for the highest transfer fee ever paid for a teenaged soccer player. Players like Di Maria and the woeful Radamael Falcao were shown the door while the team as a whole did not get better. A transfer fiasco swirled around Spain goalkeeper David de Gea, causing resentment and giving credence to rumors that the locker room was not on the side of their manager. The club also brought in veterans like Bastian Schweinsteiger and Morgan Schneiderlin but neither performed as hoped. Man United struggled through the season and despite high profile players at nearly every position it was the youth at Manchester United that provided the quality. Previously unknown youth striker Marcus Rashford scored a miraculous brace against Arsenal that sent the North-London club into a tailspin. Martial won a starting spot and eased many concerns about his large transfer fee by displaying real quality that, like Manchester as a club, should only get improve with time . By midseason rumors appeared that ousted Chelsea boss Jose Mourinho was being tapped to replace van Gaal in the offseason. Participation in the Champion’s League was again in jeopardy for the team, as a top-four finish couldn’t be guaranteed. And that is how it played out for the Red Devil’s faithful, as cross-town rivals Manchester City secured fourth place on the final day of the season and sent United to the Europa league. The frustration around Old Trafford seemed ready to burst. The press pounded away at van Gaal with rumors that he had lost the locker room; especially one that blamed his film strategy with the players. Some of these rumors have been blamed on the agent of Jose Mourinho who was surely looking to make sure that his client landed a top managerial post. 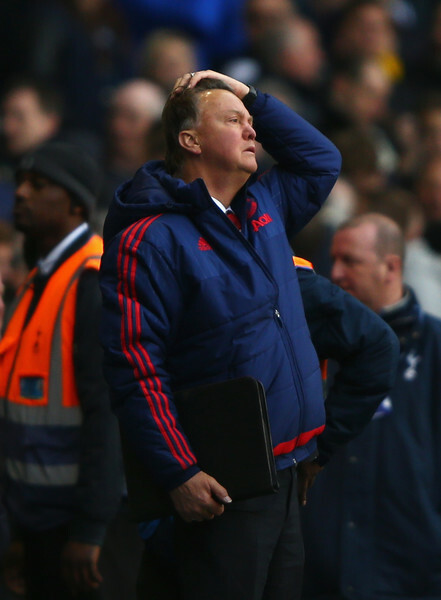 Regardless of where the leaks came from, it was clear that van Gaal’s tenure was in jeopardy. Under intense amounts of scrutiny, van Gaal was defiant in the press, stating that he was the manager and that he had a three year contract, for a three year turn-around. Throughout all of this, United’s FA cup run was the bright spot as they swept aside two-time defending cup holders Arsenal and came into the final against Crystal Palace hoping to salvage what had been an otherwise disappointing season. It seemed that if United could get the final right, then van Gaal might be given another year to show that he had turned the team around. United, and van Gaal, orchestrated an extra time, comeback win in the FA Cup final, in what was for Untied fans, an instant classic. Twenty four hours later, the manager was fired. The lack of attacking play was the most visible problem. During the halcyon days of Ferguson, United punished opponents with shots. During the 2006-2009 title years they averaged 14.02 shots per game and scored an average of 77 goals a season. During van Gaal’s two seasons the team averaged only 8.74 shots per game and 55 goals a season. It may be unfair comparing one of the best teams in premier league history to van Gaal’s clearly transitional squad, but he was brought in just two years removed from a championship and clearly expected to win. A 40% decrease in shots is unacceptable for a team unless they are converting goals at an outstanding rate and winning games with less shots. But the goals per game dropped from 2.03 to 1.46 as well. That average was even lower than the 1.68 goals per game during the Moyes year, the low point for the modern Man Utd. Unlike American sports franchises, British soccer giants don’t have rebuilding years, they are simply expected to reload and continue to compete for titles. Manchester United dominated the Premier league and global soccer for the majority of the 26 years during Sir Alex Ferguson’s reign. Thanks to their success, and a certain dashingly-handsome superstar David Beckham, the Red Devils were the face of soccer around the world as the game reached new heights of popularity. With their incredible popularity, and the increasing TV revenue that come with it, United were supposed to stay on top of the league for years to come, as is normally the case in soccer. With no draft to rebuild through or a salary cap there are not many opportunities for smaller teams to really crack the elite teams with the biggest bank accounts. Because of this, the expectations are always high: United must win every year, must go the Champions league every year, must always finish above teams like Leicester City, and compete against the Manchester Citys, Chelseas, and Arsenals in every competition. If they don’t win then the spending doesn’t make sense; buying the most expensive teenager in history, regardless of his talent, just doesn’t make sense. The underdog shouldn’t win, Manchester United has to. With those expectations on the table and the money that is spent to bring in the best talent, the manager’s seat at Old Trafford will always be hot. Money and soccer are always interconnected at the highest levels of the game. Money brings in the best players, the best players win, the club makes money from TV revenue and winning to then go spend more money on more players, and the cycle continues. That is how it is supposed to work for a club like United, but when you spend as freely as they have over the last few years and still struggling to crack the top-4 of the Premier League and failing to qualify for the Champions League has cost the club millions of dollars. That missing money is especially concerning with the Premier League’s new TV deal breathing money and life into formerly 2nd tier clubs, thus cutting into the heavy advantage clubs like United have had over their fellow countrymen. Arsenal was announced to have received the largest Premier league payout for the ‘15-‘16 season, and became the first team to top 100 million pounds. Manchester United came in at 96 million pounds (around $142 million) while league leaders Leicester City earned 93 million pounds (around $137 Million). In fact, you have to jump all the way down to 10th place Stoke City to find a team that will earn less than 84 million pounds, meaning plenty of teams will have the resources to chip into the normally impenetrable top-4 spots in the Premiere League causing more problems for United’s re-ascension to the top. New money means more money to spend on players, and with the new home-grown rules imposed by the FA, British trained players will cost even more. For a team of international superstars like Manchester United that means that it will be forced to over pay for players that may not even start. This new money also means that teams like Leicester City, Tottenham and West Ham, aren’t going away any time soon. The miracle championship run of Leicester can be followed up by that team spending the 93 million pounds it earned and use it to bolster its title defense while in years past it would have meant that at least some of the stars would be sold off as the incoming transfer offers would have just been too good to pass up. Even Arsenal’s ‘03-‘04 “Invincibles” squad was broken up over the following 5 years for the money needed to fund the Emirates Stadium. With wins and losses meaning the difference between millions of dollars it’s no wonder that van Gaal was ousted after only two years. There is serious inflation in the Premier League and even though Manchester United is still a cash-rich behemoth, finishing below upstarts and rivals means that the gap is starting to close. United, with its 200 million a year team salary, is an expensive team that must dominate the increasingly egalitarian league. Unless it banishes upstarts and secures its place above its rivals then the footholds established now, through the investment of league winnings, could create many more rivals to come. Louis van Gaal didn’t just fall victim to being a bad manager, an aloof manager, or simply the unlucky guy to follow a legend of the game. He was at once all of those things. But in managing Manchester United, he made a deal with the (Red) devil that a rebuilding manager was never going to be allowed to see through. Now it is up to Mourinho to pick up the torch and carry this team back to the mountaintop.